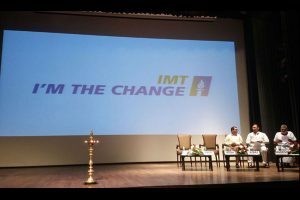 IMT Ghaziabad, India’s premier management school with a distinct focus on innovation, execution and social responsibility, launched a Sustainability and Social Responsibility (SSR) initiative titled I’M The Change on Saturday, October 1, 2016, on the eve of Mahatma Gandhi’s birthday. The initiative was launched in the presence of eminent Gandhian Shri Ramesh Bhaiya of Vinoba Sewa Ashram and dignitaries from Ghaziabad local administration at the institute’s campus in Ghaziabad, Delhi NCR. Inspired by Mahatma Gandhi’s teaching ‘Be the change you want to see in the world’, the initiative I’M The Change is the institute’s endeavour towards not just preaching but also practicing SSR. The first steps taken under the initiative are a course on SSR and a Talk Series. The course, titled ‘Sustainability and Social Responsibility’ is a mandatory three-credit course for the first year students of IMTG’s flagship two-year PGDM Programme from the 2016-18 batch onwards. The purpose of this course is to enable the students imbibe the ethos of sustainability, social responsibility and distributive justice and realise ‘contribution’ as a value through hands-on execution of live social projects in and around Ghaziabad and Delhi NCR. Students, working in groups will be exposed to situations that will allow them to see how people live, especially the underprivileged. Each group will then identify a particular social challenge to be addressed and/or zero in on a specific area with a potential for making a meaningful contribution to society by applying their knowledge, skills, aptitudes and innovation. With the identified objective in view, each group will propose an implementation plan with concrete deliverables and will go about implementing it on the ground (through 10/11 field visits). Learning will be predominantly experiential, with the course containing only a few indoor sessions. The main focus of the pedagogy is on the ‘doing’ component (i.e. execution of a social project as a member of a team with ample scope for acting innovatively), while the vision underlying the course is on the ‘being’ component, i.e. to help inculcate values, attitudes, and beliefs that form a manager’s worldviews and professional identities. The course will allow students an experiential appreciation of social contexts and challenges at the ‘bottom of the pyramid’ – people who are unlike oneself. The launch event witnessed active participation from the Ghaziabad local administration and public representatives. Ghaziabad Mayor Shri Ashu Verma was the Chief Guest at the event while ADM City Smt Priti Jayaswal and SP City Shri Salman Taj also graced the dais. Shri Satish Kaura, Padma Shri awardee and CMD, Samtel Group represented the IMTG Governing Council at the event. “Ghaziabad Nagar Nigam has already partnered with IMTG for social projects and the students played an active part during the Swachh Bharat Week on the 2nd anniversary of Swachh Bharat Abhiyan. Many more projects are lined-up,” he added. The event also marked the launch of I’M The Change Talk Series. In this series, IMTG will invite persons with exemplary contribution in the area of sustainability or towards bringing in positive social change. The first talk of the series was delivered by an eminent Gandhian Shri Ramesh Bhaiya, Founder of Vinoba Sewa Ashram, Shahjahanpur and recipient of the 2011 Jamnalal Bajaj Award for the Outstanding Contribution in the Field of Constructive Work. The event concluded with a vote of thanks by Dr. Kasturi Das. Established in 1980, Institute of Management Technology, Ghaziabad (IMTG) is India’s premier AACSB accredited management school with a distinct focus on grooming leadership through innovation, execution and social responsibility. An autonomous, not-for-profit institute, offering highly sought-after postgraduate programmes over the past more than three-and-a-half decades, IMTG currently offers four AICTE approved programmes – Post Graduate Diploma in Management (PGDM) Full Time, PGDM Executive, PGDM Part Time, and PGDM Dual Country Programme (DCP). While the first three programmes are offered at the IMTG campus in Ghaziabad, Delhi NCR, India, the PGDM DCP is offered in collaboration with IMT Dubai campus. Today, IMTG is the proud alma mater of more than 300 C-suite executives and thousands of professionals serving in leadership positions in the best known organisations in India and the world, in key business functions of sales, operations, human resources, consulting, information technology, marketing, and finance among others.